The meaning of the word truth extends from honesty, good faith, and sincerity in general, to agreement with fact or reality in particular. The term has no single definition that the majority of professional philosophers and scholars agree on, as various theories of truth continue to be debated. There are differing claims on questions regarding truth, such as what constitutes truth, how to define and identify truth, the roles that revealed and acquired knowledge play, and whether truth is subjective, relative, objective, or absolute. This article introduces the various perspectives and claims in philosophy. In religious contexts, truth is often attributed to the divine origin and associated as being eternal, absolute, and immutable. Truth is also understood not only as a matter of conceptual understanding, but as an issue of embodiment, which involves an existential way of being, religious experience, or way of living. An example is in Jesus' words "I am the truth" that indicate an inseparable relationship between truth and human existence. English truth is from Old English tríewþ, tréowþ, trýwþ, Middle English trewþe, cognate to Old High German triuwida, Old Norse tryggð. Like troth, it is a -th nominalisation of the adjective true (Old English tréowe). The English word true is derived from the Old English (West Saxon) word (ge)tríewe, tréowe, cognate to Old Saxon (gi)trûui, Old High German (ga)triuwu (Modern German treu "faithful"), Old Norse tryggr, Gothic triggws., all from a Proto-Germanic *trewwj- "having good faith." Old Norse trú, means "faith, word of honour; religious faith, belief" (archaic English troth "loyalty, honesty, good faith," compare Ásatrú). 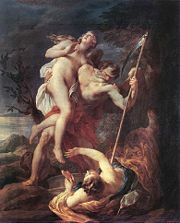 Thus, truth in its original sense is the quality of "faithfulness, fidelity, loyalty, sincerity, veracity",, and the narrowed sense "in agreement with fact or reality," in Anglo-Saxon expressed by sōþ, is a secondary development coupled to the process of "Enlightenment" in seventeenth century philosophy. All Germanic languages besides English have introduced a terminological distinction between truth "fidelity" and truth "factuality." To express "factuality," North Germanic opted for nouns derived from sanna "to assert, affirm," while continental West Germanic (German and Dutch) opted for continuations of wâra "faith, trust, pact" (cognate to Slavic věra "(religious) faith," but influenced by Latin verus). Romance languages use terms continuing Latin veritas, while Greek with aletheia and Slavic with pravda have unrelated terms. Questions about what is a proper basis on which to decide how words, symbols, ideas and beliefs may properly be said to constitute truth, whether for a single person or an entire community or society, are among the many questions addressed by the theories introduced below. Each of the five substantive theories below deal with truth as something with a nature, a phenomenon, or thing, or type of human experience about which significant things can be said. These theories each present perspectives that are widely agreed by published scholars to apply in some way to a broad set of occurrences that can be observed in human interaction, or which offer significant, stable explanations for issues related to the idea of truth in human experience. There also have more recently arisen "deflationary" or "minimalist" theories of truth based on the idea that the application of a term like true to a statement does not assert anything significant about it, for instance, anything about its nature, but that the label truth is a tool of discourse used to express agreement, to emphasize claims, or to form certain types of generalizations. Correspondence theories claim that true beliefs and true statements correspond to the actual state of affairs. This type of theory attempts to posit a relationship between thoughts or statements on the one hand and things or objects on the other. It is a traditional model which goes back at least to some of the classical Greek philosophers such as Socrates, Plato, and Aristotle. This class of theories holds that the truth or the falsity of a representation is determined in principle solely by how it relates to objective reality, by whether it accurately describes that reality. For example, there is a true distance to the moon when we humans attempt to go there, and this true distance is necessary to know so that the journey can be successfully made. Correspondence theory traditionally operates on the assumption that truth is a matter of accurately copying "objective reality" and then representing it in thoughts, words and other symbols. More modern theorists have stated that this ideal cannot be achieved independently of some analysis of additional factors. For example, language plays a role in that all languages have words that are not easily translatable into another. The German word Zeitgeist is one such example: one who speaks or understands the language may "know" what it means, but any translation of the word fails to accurately capture its full meaning (this is a problem with many abstract words, especially those derived in agglutinative languages). Thus, the language itself adds an additional parameter to the construction of an accurate truth predicate. Among the philosophers who grappled with this problem is Alfred Tarski, whose semantic theory is summarized further below in this article. Proponents of several of the theories below have gone farther to assert that there are yet other issues necessary to the analysis, such as interpersonal power struggles, community interactions, personal biases and other factors involved in deciding what is seen as truth. Social constructivism holds that truth is constructed by social processes, is historically and culturally specific, and that it is in part shaped through the power struggles within a community. Constructivism views all of our knowledge as "constructed," because it does not reflect any external "transcendent" realities (as a pure correspondence theory might hold). Rather, perceptions of truth are viewed as contingent on convention, human perception, and social experience. It is believed by constructivists that representations of physical and biological reality, including race, sexuality, and gender are socially constructed. Giambattista Vico was among the first to claim that history and culture were man-made. Vico's epistemological orientation gathers the most diverse rays and unfolds in one axiom—verum ipsum factum—"truth itself is constructed." Hegel, Garns, and Marx were among the other early proponents of the premise that truth is socially constructed. Among the current advocates of consensus theory as a useful accounting of the concept of "truth" is the philosopher Jürgen Habermas, who maintains that truth is what would be agreed upon in an ideal speech situation. Among the current strong critics of consensus theory is the philosopher Nicholas Rescher. The three most influential forms of the pragmatic theory of truth were introduced around the turn of the twentieth century by Charles S. Peirce, William James, and John Dewey. Although there are wide differences in viewpoint among these and other proponents of pragmatic theory, they hold in common that truth is verified and confirmed by the results of putting one's concepts into practice. Peirce defines truth as follows: "Truth is that concordance of an abstract statement with the ideal limit towards which endless investigation would tend to bring scientific belief, which concordance the abstract statement may possess by virtue of the confession of its inaccuracy and one-sidedness, and this confession is an essential ingredient of truth." This statement emphasizes Peirce's view that ideas of approximation, incompleteness, and partiality, what he describes elsewhere as fallibilism and "reference to the future," are essential to a proper conception of truth. Although Peirce uses words like concordance and correspondence to describe one aspect of the pragmatic sign relation, he is also quite explicit in saying that definitions of truth based on mere correspondence are no more than nominal definitions, which he accords a lower status than real definitions. William James's version of pragmatic theory, while complex, is often summarized by his statement that "the 'true' is only the expedient in our way of thinking, just as the 'right' is only the expedient in our way of behaving." By this, James meant that truth is a quality the value of which is confirmed by its effectiveness when applying concepts to actual practice (thus, "pragmatic"). Michael says, 'snow is white' and snow is white, or he says 'roses are red' and roses are red or he says …etc. But it can be expressed succinctly by saying: "Whatever Michael says is true." Attributed to P. F. Strawson is the performative theory of truth which holds that to say "'Snow is white' is true" is to perform the speech act of signaling one's agreement with the claim that snow is white (much like nodding one's head in agreement). The idea that some statements are more actions than communicative statements is not as odd as it may seem. Consider, for example, that when the bride says "I do" at the appropriate time in a wedding, she is performing the act of taking this man to be her lawful wedded husband. She is not describing herself as taking this man. In a similar way, Strawson holds: "To say a statement is true is not to make a statement about a statement, but rather to perform the act of agreeing with, accepting, or endorsing a statement. When one says 'It's true that it's raining,' one asserts no more than 'It's raining.' The function of [the statement] 'It's true that….' is to agree with, accept, or endorse the statement that 'it's raining.'" According to the redundancy theory of truth, asserting that a statement is true is completely equivalent to asserting the statement itself. For example, making the assertion that " 'Snow is white' is true" is equivalent to asserting "Snow is white." Redundancy theorists infer from this premise that truth is a redundant concept; that is, it is merely a word that is traditionally used in conversation or writing, generally for emphasis, but not a word that actually equates to anything in reality. This theory is commonly attributed to Frank P. Ramsey, who held that the use of words like fact and truth was nothing but a roundabout way of asserting a proposition, and that treating these words as separate problems in isolation from judgment was merely a "linguistic muddle." A variant of redundancy theory is the disquotational theory which uses a modified form of Tarski's schema: To say that '"P" is true' is to say that P. Yet another version of deflationism is the prosentential theory of truth, first developed by Dorothy Grover, Joseph Camp, and Nuel Belnap as an elaboration of Ramsey's claims. They argue that sentences like "That's true," when said in response to "It's raining," are prosentences, expressions that merely repeat the content of other expressions. In the same way that it means the same as my dog in the sentence My dog was hungry, so I fed it, That's true is supposed to mean the same as It's raining — if you say the latter and I then say the former. These variations do not necessarily follow Ramsey in asserting that truth is not a property, but rather can be understood to say that, for instance, the assertion "P" may well involve a substantial truth, and the theorists in this case are minimalizing only the redundancy or prosentence involved in the statement such as "that's true." Deflationary principles do not apply to representations that are not analogous to sentences, and also do not apply to many other things that are commonly judged to be true or otherwise. Consider the analogy between the sentence "Snow is white" and the person Snow White, both of which can be true in a sense. To a minimalist, saying "Snow is white is true" is the same as saying "Snow is white," but to say "Snow White is true" is not the same as saying "Snow White." Historically, with the nineteenth century development of Boolean algebra mathematical models of logic began to treat "truth," also represented as "T" or "1," as an arbitrary constant. "Falsity" is also an arbitrary constant, which can be represented as "F" or "0." In propositional logic, these symbols can be manipulated according to a set of axioms and rules of inference, often given in the form of truth tables. In addition, from at least the time of Hilbert's program at the turn of the twentieth century to the proof of Gödel's theorem and the development of the Church-Turing thesis in the early part of that century, true statements in mathematics were generally assumed to be those statements which are provable in a formal axiomatic system. The works of Kurt Gödel, Alan Turing, and others shook this assumption, with the development of statements that are true but cannot be proven within the system. Two examples of the latter can be found in Hilbert's problems. Work on Hilbert's 10th problem led in the late twentieth century to the construction of specific Diophantine equations for which it is undecidable whether they have a solution, or even if they do, whether they have a finite or infinite number of solutions. More fundamentally, Hilbert's first problem was on the continuum hypothesis. Gödel and Paul Cohen showed that this hypothesis cannot be proved or disproved using the standard axioms of set theory and a finite number of proof steps. In the view of some, then, it is equally reasonable to take either the continuum hypothesis or its negation as a new axiom. where 'P' is a reference to the sentence (the sentence's name), and P is just the sentence itself. Logician and philosopher Alfred Tarski developed the theory for formal languages (such as formal logic). Here he restricted it in this way: no language could contain its own truth predicate, that is, the expression is true could only apply to sentences in some other language. The latter he called an object language, the language being talked about. (It may, in turn, have a truth predicate that can be applied to sentences in still another language.) The reason for his restriction was that languages that contain their own truth predicate will contain paradoxical sentences like the Liar: This sentence is not true. See The Liar paradox. As a result Tarski held that the semantic theory could not be applied to any natural language, such as English, because they contain their own truth predicates. Donald Davidson used it as the foundation of his truth-conditional semantics and linked it to radical interpretation in a form of coherentism. Bertrand Russell is credited with noticing the existence of such paradoxes even in the best symbolic formalizations of mathematics in his day, in particular the paradox that came to be named after him, Russell's paradox. Russell and Whitehead attempted to solve these problems in Principia Mathematica by putting statements into a hierarchy of types, wherein a statement cannot refer to itself, but only to statements lower in the hierarchy. This in turn led to new orders of difficulty regarding the precise natures of types and the structures of conceptually possible type systems that have yet to be resolved to this day. Begin with a subset of sentences of a natural language that contains no occurrences of the expression "is true" (or "is false"). So The barn is big is included in the subset, but not "The barn is big is true," nor problematic sentences such as "This sentence is false." Then extend the definition of truth to include sentences that predicate truth or falsity of one of the original subset of sentences. So "The barn is big is true" is now included, but not either "This sentence is false" nor "'The barn is big is true' is true." Next, define truth for all sentences that predicate truth or falsity of a member of the second set. Imagine this process repeated infinitely, so that truth is defined for The barn is big; then for "The barn is big is true"; then for "'The barn is big is true' is true," and so on. Notice that truth never gets defined for sentences like This sentence is false, since it was not in the original subset and does not predicate truth of any sentence in the original or any subsequent set. In Kripke's terms, these are "ungrounded," since these sentences are never as assigned either truth or falsehood even if the process is carried out infinitely, Kripke's theory implies that some sentences are neither true nor false. This contradicts the Principle of bivalence: every sentence must be either true or false. Since this principle is a key premise in deriving the Liar paradox, the paradox is dissolved. Aristotle sounds much more like a genuine correspondence theorist in the Categories (12b11, 14b14), where he talks of “underlying things” that make statements true and implies that these “things” (pragmata) are logically structured situations or facts (viz., his sitting, his not sitting). Most influential is his claim in De Interpretatione (16a3) that thoughts are “likenessess” (homoiosis) of things. Although he nowhere defines truth in terms of a thought's likeness to a thing or fact, it is clear that such a definition would fit well into his overall philosophy of mind. Thomas Aquinas said that veritas est adæquatio intellectus et rei, truth is the conformity of the intellect to the things, an elegant re-statement of Aristotle's view. Immanuel Kant discussed the correspondence theory of truth in the following manner. Kant's criticism of correspondence theory is one of numerous examples of why so many thinkers who examine the question of truth are not satisfied to rest with this first theory that usually comes to mind. Truth is said to consist in the agreement of knowledge with the object. According to this mere verbal definition, then, my knowledge, in order to be true, must agree with the object. Now, I can only compare the object with my knowledge by this means, namely, by taking knowledge of it. My knowledge, then, is to be verified by itself, which is far from being sufficient for truth. For as the object is external to me, and the knowledge is in me, I can only judge whether my knowledge of the object agrees with my knowledge of the object. Such a circle in explanation was called by the ancients Diallelos. And the logicians were accused of this fallacy by the sceptics, who remarked that this account of truth was as if a man before a judicial tribunal should make a statement, and appeal in support of it to a witness whom no one knows, but who defends his own credibility by saying that the man who had called him as a witness is an honorable man. According to Kant, the definition of truth as correspondence is a "mere verbal definition," here making use of Aristotle's distinction between a nominal definition, a definition in name only, and a real definition, a definition that shows the true cause or essence of the thing whose term is being defined. From Kant's account of the history, the definition of truth as correspondence was already in dispute from classical times, the "skeptics" criticizing the "logicians" for a form of circular reasoning, though the extent to which the "logicians" actually held such a theory is not evaluated. When Søren Kierkegaard, as his character Johannes Climacus, wrote that "Truth is Subjectivity", he does not advocate for subjectivism in its extreme form (the theory that something is true simply because one believes it to be so), but rather that the objective approach to matters of personal truth cannot shed any light upon that which is most essential to a person's life. Objective truths are concerned with the facts of a person's being, while subjective truths are concerned with a person's way of being. Kierkegaard agrees that objective truths for the study of subjects like mathematics, science, and history are relevant and necessary, but argues that objective truths do not shed any light on a person's inner relationship to existence. At best, these truths can only provide a severely narrowed perspective that has little to do with one's actual experience of life. Friedrich Nietzsche believed the search for truth or 'the will to truth' was a consequence of the will to power of philosophers. He thought that truth should be used as long as it promoted life and the will to power, and he thought untruth was better than truth if it had this life enhancement as a consequence. As he wrote in Beyond Good and Evil, "The falseness of a judgment is to us not necessarily an objection to a judgment…. The question is to what extent it is life-advancing, life-preserving, species-preserving, perhaps even species-breeding…." (aphorism 4). He proposed the will to power as a truth only because according to him it was the most life affirming and sincere perspective one could have. Some scholars regard Nietzsche's 1873 unpublished essay, "On Truth and Lies in a Nonmoral Sense" ("Über Wahrheit und Lüge im außermoralischen Sinn") as a keystone in his thought. In this essay, Nietzsche rejects the idea of universal constants, and claims that what we call "truth" is only "a mobile army of metaphors, metonyms, and anthropomorphisms." His view at this time is that arbitrariness completely prevails within human experience: concepts originate via the very artistic transference of nerve stimuli into images; "truth" is nothing more than the invention of fixed conventions for merely practical purposes, especially those of repose, security and consistence. Heidegger's concept of truth is complex. He defined truth as "dis-closedness" or "un-concealment" by applying a Greek term, "Aletheia" (ἀ–λήθεια). In Classical Greek, "Lethe" (λήθη; lêthê) literally means "forgetfulness" or "concealment." It is related to the Greek word for "truth": a-lethe-ia (αλήθεια), meaning "un-forgetfulness" or "un-concealment." In Heidegger's ontology, Dasein (human being) is the locus where truth becomes evident. Although human being has an implicit understanding of truth, truth is usually concealed or forgotten because human being exists in "inauthentic" mode. Only when human being restored its "authentic" mode of existence, human being becomes a being where truth is manifested. From Heidegger's perspective, man's openness to the world is the fundamental condition that allows man to encounter things in the world. Theoretical knowledge and truth, including the correspondence of knowledge and reality, become possible due to man's ontological openness to truth. Heidegger tried to conceptualize the process of disclosure of truth by tying it to man's modes, authentic or inauthentic, of being. Heidegger took "listening to the voice of conscience" and encounter with one's death (non-being) as two primary ways to restore one's authentic mode of existence. Gandhi dedicated his life to the wider purpose of discovering truth, or Satya. He tried to achieve this by learning from his own mistakes and conducting experiments on himself. He called his autobiography The Story of My Experiments with Truth. Gandhi stated that the most important battle to fight was overcoming his own demons, fears, and insecurities. Gandhi summarized his beliefs first when he said "God is Truth." He would later change this statement to "Truth is God." Thus, Truth in Gandhi's philosophy is God. Alfred North Whitehead a British mathematician who became an American philosopher, said: "There are no whole truths; all truths are half-truths. It is trying to treat them as whole truths that plays the devil." According to Kitaro Nishida, "[k]nowledge of things in the world begins with the differentiation of unitary consciousness into knower and known and ends with self and things becoming one again. Such unification takes form not only in knowing but in the valuing (of truth) that directs knowing, the willing that directs action, and the feeling or emotive reach that directs sensing." Erich Fromm finds that trying to discuss truth as "absolute truth" is sterile and that emphasis ought to be placed on "optimal truth." He considers truth as stemming from the survival imperative of grasping one's environment physically and intellectually, whereby young children instinctively seek truth so as to orient themselves in "a strange and powerful world." The accuracy of their perceived approximation of the truth will therefore have direct consequences on their ability to deal with their environment. Fromm can be understood to define truth as a functional approximation of reality. His vision of optimal truth is described partly in "Man from Himself: An Inquiry into the Psychology of Ethics" (1947), from which excerpts are included below. the dichotomy between 'absolute = perfect' and 'relative = imperfect' has been superseded in all fields of scientific thought, where "it is generally recognized that there is no absolute truth but nevertheless that there are objectively valid laws and principles." In that respect, "a scientifically or rationally valid statement means that the power of reason is applied to all the available data of observation without any of them being suppressed or falsified for the sake of a desired result." The history of science is "a history of inadequate and incomplete statements, and every new insight makes possible the recognition of the inadequacies of previous propositions and offers a springboard for creating a more adequate formulation." Truth, for Michel Foucault, is problematic when any attempt is made to see truth as an "objective" quality. He prefers not to use the term truth itself but "Regimes of Truth." In his historical investigations he found truth to be something that was itself a part of, or embedded within, a given power structure. Thus Foucault's view shares much in common with the concepts of Nietzsche. Truth for Foucault is also something that shifts through various episteme throughout history. Some example simulacra that Baudrillard cites are: that prisons simulate the "truth" that society is free; scandals (e.g., Watergate) simulate that corruption is corrected; Disney simulates that the U.S. itself is an adult place. One must remember that though such examples seem extreme, such extremity is an important part of Baudrillard's philosophy. For a less extreme example consider how movies, almost without exception, end with the bad guy being punished, thus drilling into the viewers that successful businessmen and politicians are good or, if not, will be caught. In religious contexts, truth has often such attributes as eternity, immutability, and transcendence, and attributed to God or some divine existence. Furthermore, truth is often not simply a conceptual knowledge but existential matter. In other words, man comes to understand or become aware of truth only through religious practices or process of embodiment. Jesus' words "I am the truth," for example, implies that he is the embodiment of truth. In Zen Buddhism, truth become available not through conceptual understanding but through the experience of "enlightenment." It is the body-mind experience which involves existential turn of one's life. The Four Noble Truths are the most fundamental Buddhist teachings and appear countless times throughout the most ancient Buddhist texts, the Pali Canon. They arose from Buddha's enlightenment, and are regarded in Buddhism as deep spiritual insight, not as philosophical theory, with Buddha noting in the Samyutta Nikaya: "These Four Noble Truths, monks, are actual, unerring, not otherwise. Therefore they are called noble truths." The truth of suffering. Suffering applies to the following: Birth, aging, illness, death; union with what is displeasing; separation from what is pleasing; and to not get what one wants. The truth that suffering originates within us from the craving for pleasure and for being or nonbeing. The truth that this craving can be eliminated (Nirvana). The truth that this elimination is the result of a methodical way or path that must be followed, which is known as the Noble Eightfold Path. There is no unilateral agreement amongst the different denominations of Judaism concerning truth. In Orthodox Judaism, truth is the revealed word of God, as found in the Old Testament, and to a lesser extent, in the words of the sages of the Talmud. For Hasidic Jews (an Orthodox sect), truth is also found in the pronouncements of their rebbe, or spiritual leader, who is believed to possess divine inspiration..Kotzk, a Polish Hasidic sect, was known for their obsession with truth. In Conservative Judaism, truth is not defined as literally as it is amongst the Orthodox. While Conservative Judaism acknowledges the truth of the Old Testament, generally, it does not accord that status to every single statement or word contained therein, as do the Orthodox. Moreover, unlike Orthodox Judaism, Conservative Judaism believes that the nature of truth can vary from generation to generation, depending on circumstances. For instance, with respect to halakhah, or Jewish law (which loosely-speaking can be described as the will of God as expressed in day-to-day activity), Conservative Judaism believes that it can be modified or adapted depending on the needs of the people. In Orthodox Judaism, by contrast, the halakhah is fixed (by the sages of the Talmud and later authorities); the present-day task, therefore, is to interpret the halakhah, but not to change it. Reform Judaism takes a much more liberal approach to truth. It does not hold that truth is only found in the Old Testament; rather, there are kernels of truth to be found in practically every religious tradition. Moreover, its attitude towards the Old Testament is, at best, a document parts of which may have been inspired, but with no particular monopoly on truth, or in any way legally binding. 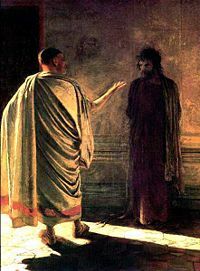 Nikolai Ge's What is Truth?, depicting the New Testament account of the question as posed by Pilate to Jesus. Assertions of truth based upon history, revelation and testimony set forward in the Bible are central to Christian beliefs. Some denominations have asserted additional authorities as sources of doctrinal truth — for instance, in Roman Catholicism the Pope is asserted to be infallible on matters of church doctrine. The central person in Christianity, Jesus, claimed to be "Truth" when he said, "I am the Way and the Truth and the Life; no one comes to the Father but through me." In Christian Science, Truth is God. Some Christian traditions hold a doctrine called Biblical inerrancy, which asserts that the Bible is without error, that is, it can be said to be true as to all issues contained within, whether Old Testament or New. Various interpretations have been applied, depending on the tradition. According to some interpretations of the doctrine, all of the Bible is without error, i.e., is to be taken as true, no matter what the issue. Other interpretations hold that the Bible is always true on important matters of faith, while yet other interpretations hold that the Bible is true but must be specifically interpreted in the context of the language, culture and time that relevant passages were written. The Roman Catholic Church holds that it has a continuous teaching authority, magisterium, which preserves the definitive, i.e.. the truthful, understanding of scripture. The notion of the Pope as "infallible" in matters of faith and morals is derived from this idea. In thirteenth century Europe, the Roman Catholic Church denounced what it described as theories of "double truth," i.e., theories to the effect that although a truth may be established by reason, its contrary ought to be believed as true as a matter of faith. The condemnation was aimed specifically at a "Latin Averroist" (see Averroës), Siger of Brabant, but it was more broadly an attempt to halt the spread of Aristotle's ideas, which the reconquest of Spain and, accordingly, access to the libraries of the Moors had re-introduced into the Latin literate world. At the time, much of the doctrine of the Roman Catholic Church was based upon neoplatonic ideas, and Aristoteleanism struck many as heresy. Siger and others seem to have conceded this, and to have used the sharp reason/faith distinction that came to be known as "double truth" as a way of legitimizing discussion of Aristotle despite that concession. Although, historically, Jain authors have adopted different views on truth, the most prevalent is the system of anekantavada or "not-one-sidedness." This idea of truth is rooted in the notion that there is one truth, but that only enlightened beings can perceive it in its entirety; unenlightened beings only perceive one side of the truth (ekanta). Anekantavada works around the limitations of a one-sided view of truth by proposing multiple vantage points (nayas) from which truth can be viewed (cf. nayavada). Recognizing that there are multiple possible truths about any particular thing, even mutually exclusive truths, Jain philosophers developed a system for synthesizing these various claims, known as syadvada. Within the system of syadvada, each truth is qualified to its particular view-point; that is "in a certain way," one claim or another or both may be true. "Legends and myths are largely made of 'truth', and indeed present aspects of truth that can only be received in this mode." ↑ see Holtzmann's law for the -ww- : -gg- alternation. ↑ Zoega (1910) Zoëga's A Concise Dictionary of Old Icelandic, Northvegr Foundation. Retrieved November 3, 2007. ↑ OED on true has "Steadfast in adherence to a commander or friend, to a principle or cause, to one's promises, faith, etc. ; firm in allegiance; faithful, loyal, constant, trusty; Honest, honourable, upright, virtuous, trustworthy; free from deceit, sincere, truthful " besides "Conformity with fact; agreement with reality; accuracy, correctness, verity; Consistent with fact; agreeing with the reality; representing the thing as it is; Real, genuine; rightly answering to the description; properly so called; not counterfeit, spurious, or imaginary." ↑ Attested since the early seventeenth century, e.g., Shakespeare in As You Like It (5.4) has "If there be truth in sight, you are my daughter. "; William Prynne in his A briefe survay and censure of Mr Cozens his couzening devotions (1628) has "I haue here sufficiently euidenced the trueth of this Assertion." Retrieved November 10, 2007. ↑ Simon Blackburn and Keith Simmons, (eds. ), Truth. (Oxford, UK: Oxford University Press, 1999). Includes papers by James, Ramsey, Russell, Tarski, and more recent work. ↑ Hartry Field. Truth and the Absence of Fact. (2001). ↑ Arthur N. Prior, "Correspondence Theory of Truth," Encyclopedia of Philosophy, Vol.2, (Macmillan, 1969), 223. Prior uses Bertrand Russell's wording in defining correspondence theory. According to Prior, Russell was substantially responsible for helping to make correspondence theory widely known under this name. Retrieved November 10, 2007. ↑ Arthur N. Prior, "Correspondence Theory of Truth," Encyclopedia of Philosophy, Vol.2, (Macmillan, 1969), 223-224. ↑ F. H. Bradley, "On Truth and Copying," in Blackburn, et al. (eds. ), Truth, (1999), 31-45. ↑ Immanuel Kant, for instance, assembled a controversial but quite coherent system in the early nineteenth century, whose validity and usefulness continues to be debated even today. Similarly, the systems of Leibniz and Spinoza are characteristic systems that are internally coherent but controversial in terms of their utility and validity. Retrieved November 10, 2007. ↑ Alan R. White, "Coherence Theory of Truth," Encyclopedia of Philosophy, Vol.2, (New York: Macmillan, 1969), 130-131. ↑ Alan R. White, "Coherence Theory of Truth," Encyclopedia of Philosophy, Vol.2, (New York: Macmillan, 1969), 131-133, see esp., section on "Epistemological assumptions." ↑ Alan R. White, "Coherence Theory of Truth," Encyclopedia of Philosophy, Vol.2, 130. ↑ Jürgen Habermas, Knowledge and Human Interests, English translation by Jeremy J. Shapiro, (Boston: Beacon Press, 1972. ISBN 0807015415), esp. PART III, 187 ff. ↑ Nicholas Rescher. Pluralism: Against the Demand for Consensus. (Oxford University Press, 1995. ISBN 0198236018). ↑ "Pragmatic Theory of Truth," Encyclopedia of Philosophy, Vol.5, (Macmillan, 1969), 427. ↑ C.S. Peirce, (1901), "Truth and Falsity and Error" (in part), 718–720, in J. M. Baldwin, (ed. ), Dictionary of Philosophy and Psychology, vol. 2. Reprinted, CP 5.565–573. ↑ William James. The Meaning of Truth, A Sequel to 'Pragmatism'. (1909). ↑ Richard J. Bernstein, "Dewey, John," Encyclopedia of Philosophy, Vol.2, (Macmillan, 1969), 383. ↑ Blackburn and Simmons, 1999, in the Introductory section of the book. ↑ Kirkham, Theories of Truth. (MIT Press, 1992). ↑ Gertrude Ezorsky, "Performative Theory of Truth," Encyclopedia of Philosophy, Vol.6, (Macmillan, 1969), 88. ↑ Michael Williams, "Truth," Encyclopedia of Philosophy, Supp., (Macmillan, 1996), 572-573. ↑ F.P. Ramsey, (1927), "Facts and Propositions," Aristotelian Society Supplementary Volume 7, 153–170. (Reprinted, in F.P. Ramsey, Philosophical Papers, David Hugh Mellor (ed. ), (Cambridge, UK: Cambridge University Press, 1990), 34–51. ↑ Gregory L. Chaitin. The Limits of Mathematics. (1997)(Springer, 2002. ISBN 1852336684), esp. 89 ff. ↑ Benjamin H. Yandell. The Honors Class: Hilbert's Problems and Their Solvers. (London: AK Peters, 2003. ISBN 1568812167). ↑ Gregory L. Chaitin. The Limits of Mathematics. (1997), 1-28, 89 ff. ↑ Saul Kripke, "Outline of a Theory of Truth," Journal of Philosophy 72 (1975): 690-716. ↑ 32.0 32.1 32.2 Marion David, (2005) "Correspondence Theory of Truth", Stanford Encyclopedia of Philosophy. Retrieved November 3, 2007. ↑ Summa I.16.1 Question 16. Truth, Catholic Encyclopedia. Retrieved November 3, 2007. ↑ Friedrich Nietzsche, Stanford Encyclopedia of Philosophy. Retrieved November 3, 2007. ↑ Stanford Encyclopedia of Philosophy: "Nishida Kitaro" at Nishida Kitaro, Stanford Encyclopedia of Philosophy. Retrieved November 3, 2007. ↑ M. Foucault. "The Order of Things. (London: Vintage Books, (1966) 1970). ↑ Jean Baudrillard, "Simulacra and Simulations," in Selected Writings, ed. Mark Poster (Stanford; Stanford University Press, 1988), 166 ff. Retrieved November 3, 2007. ↑ Baudrillard's attribution of this quote to Ecclesiastes is deliberately fictional. "Baudrillard attributes this quote to Ecclesiastes. However, the quote is a fabrication. see: Jean Baudrillard. Cool Memories III, 1991-95. (London: Verso, 1997). Editor’s note: In Fragments: Conversations With François L’Yvonnet. (New York: Routledge, 2004), 11, Baudrillard acknowledges this 'Borges-like' fabrication." Cited in footnote #4 in Richard G. Smith, "Lights, Camera, Action: Baudrillard and the Performance of Representations" International Journal of Baudrillard Studies 2 (1) (January 2005). Retrieved November 3, 2007. ↑ Bhikkhu Bodhi, "The Nobility of the Truths", 1992. hinduwebsite.com. Retrieved November 3, 2007. ↑ See Rebbe. Retrieved November 3, 2007. ↑ truth, Merriam-Webster Dictionary. Retrieved November 3, 2007. ↑ Marcus J. Borg. Reading the Bible Again For the First Time: Taking the Bible Seriously But Not Literally. (2002), 7-8. ↑ Etienne Gilson, "La doctrine de la double vérité," Études de philosophie médiévale. (1921), 51-69; translated as, History of Christian Philosophy in the Middle Ages (1955). ↑ Elijah Delmedigo, Stanford Encyclopedia of Philosophy. Retrieved November 3, 2007. ↑ J. R. R. Tolkien. The Letters of J. R. R. Tolkien, no. 147. Aristotle, "The Categories," Harold P. Cooke, trans., 1–109 in Aristotle, Volume 1. (Loeb Classical Library), London: William Heinemann, 1938. __________. "On Interpretation," Harold P. Cooke. trans., 111–179 in Aristotle, Volume 1. (Loeb Classical Library) London: William Heinemann, 1938. __________. "Prior Analytics," Hugh Tredennick, trans., 181–531 in Aristotle, Volume 1. (Loeb Classical Library), London: William Heinemann, 1938. __________. "On the Soul" (De Anima), W. S. Hett, trans., 1–203 in Aristotle, Volume 8. (Loeb Classical Library), London: William Heinemann, 1936. Audi, Robert. The Cambridge Dictionary of Philosophy. Cambridge University Press, 1995. Cited as CDP. ISBN 0521402247. Baldwin, James Mark, Dictionary of Philosophy and Psychology. 3 volumes in 4, New York, NY: Macmillan, 1901-1905. Baudrillard, Jean. Cool memories, traslated by Chris Turner. Verso Books, 1990. __________. Simulacra and Simulation, translated by Sheila Faria Glaser. Ann Arbor: University of Michigan Press, 1994. ISBN 0472065211. Baylis, Charles A., "Truth," 321–322 in Dagobert D. Runes, ed. Dictionary of Philosophy. Totowa, NJ: Littlefield, Adams, and Company, 1962. Benjamin, A. Cornelius, "Coherence Theory of Truth," 58 in Dagobert D. Runes, ed., Dictionary of Philosophy. Totowa, NJ: Littlefield, Adams, and Company, 1962. Blackburn, Simon, and Keith Simmons. Truth. Oxford University Press, 1999. ISBN 0198752504. Bodhi, Bhikkhu. The Connected Discourses of the Buddha: A new translation of the Samyutta Nikaya. Wisdom Publications, 2000. ISBN 0861713311. Chaitin, Gregory L. The Limits of Mathematics. (1997) Springer, 2002. ISBN 1852336684. Chandrasekhar, Subrahmanyan. Truth and Beauty. Aesthetics and Motivations in Science. University of Chicago Press, 1987. ISBN 0226100863. Chang, C.C., and H.J. Keisler, Model Theory. Amsterdam: 1973. Chomsky, Noam. The Minimalist Program. Cambridge, MA: MIT Press, 1995. ISBN 0262032295. Church, Alonzo, "Name Relation, or Meaning Relation," 204 in Dagobert D. Runes, ed., Dictionary of Philosophy. Totowa, NJ: Littlefield, Adams, and Company, 1962. __________. "Truth, Semantical," 322 in Dagobert D. Runes, ed., Dictionary of Philosophy. 1962. Costigan, Richard F. The Consensus Of The Church And Papal Infallibility: A Study In The Background Of Vatican I. Catholic University of America Press, 2005. ISBN 0813214130. Davis, Stephen T. The debate about the Bible: Inerrancy versus infallibility. (Westminster Press, 1977. ISBN 0664241190. Dewey, John. Lectures on Ethics 1900–1901, Donald F. Koch, ed. Carbondale and Edwardsville, IL: Southern Illinois University Press, 1900-1901. __________. Theory of the Moral Life, Part 2 of John Dewey and James H. Tufts. Ethics. (1908). 2nd edition, 1932. Reprinted, Arnold Isenberg, ed., Victor Kestenbaum (pref. ), New York, NY: Irvingtion Publishers, 1980. __________. Logic: The Theory of Inquiry, Reprinted, John Dewey, The Later Works, 1925–1953, Volume 12: 1938, Jo Ann Boydston, ed., Irvington, NY: 1982. ISBN 0891978313. Field, Hartry. Truth and the Absence of Fact. Oxford University Press, 2001. ISBN 0199242895. Foucault, Michel. Essential Works of Foucault, 1954–1984, Volume 1, Ethics: Subjectivity and Truth, Paul Rabinow, ed., Robert Hurley, et al., trans. New York, NY: The New Press, 1997. ISBN 1565843525. __________. Order of Things: An Archaeology of the Human Sciences. London: Vintage Books, (1966). second ed., 2001. ISBN 0415267374. Garfield, Jay L., and Murray Kiteley. Meaning and Truth: The Essential Readings in Modern Semantics. New York, NY: Paragon House, ISBN 1557783004. Geisler, Norman L. Inerrancy. Grand Rapids, MI: Zondervan, 1980. ISBN 0310392810. Gupta, Anil, "Truth," in Lou Goble, ed., The Blackwell Guide to Philosophical Logic. Malden, MA: Blackwell Publishers, 2001. ISBN 0631206922. Haack, Susan. Evidence and Inquiry: Towards Reconstruction in Epistemology. Blackwell Publishers, 1993. ISBN 0631118519. Habermas, Jürgen, "What Is Universal Pragmatics?," 1st published, "Was heißt Universalpragmatik?," Sprachpragmatik und Philosophie, Karl-Otto Apel, ed., Suhrkamp Verlag, Frankfurt am Main. Reprinted, pp. 1–68 in Jürgen Habermas. Communication and the Evolution of Society, Thomas McCarthy, trans. Boston, MA: Beacon Press, 1976. ISBN 3518061062. _________. Moral Consciousness and Communicative Action, Christian Lenhardt and Shierry Weber Nicholsen, trans., Thomas McCarthy, intro., Cambridge, MA: MIT Press, 1990. ISBN 026208192X. __________. Truth and Justification, Barbara Fultner, trans., Cambridge, MA: MIT Press, 2003. ISBN 0262083183. Horwich, Paul. Truth, 2nd ed. New York: Oxford University Press, 1988. ISBN 0198752245. James, William. A World of Pure Experience. NY: s.n., 1904. __________. Pragmatism, A New Name for Some Old Ways of Thinking, Popular Lectures on Philosophy. New York, NY: Longmans, Green, and Company, 1907. __________. The Meaning of Truth, A Sequel to 'Pragmatism'. New York, NY: Longmans, Green, and Company, 1909. __________. Essays in Radical Empiricism. Chapt. 3, "The Thing and its Relations," pp. 92–122. Cambridge, MA: Harvard University Press, 1976. ISBN 0674267176. Kant, Immanuel. Introduction to Logic. Reprinted, Thomas Kingsmill Abbott, trans., Dennis Sweet, intro., New York, NY: Barnes and Noble, 2005. Kirkham, Richard L., Theories of Truth. Cambridge, MA: MIT Press, 1992. ISBN 0262111675. Kneale, W., and M. Kneale. The Development of Logic. Oxford University Press, (1962) Reprinted with corrections, 1975. Kreitler, Hans, and Shulamith Kreitler. Psychology of the Arts. Durham, NC: Duke University Press, 1972. Le Morvan, Pierre, "Ramsey on Truth and Truth on Ramsey" in British Journal for the History of Philosophy 12 (4) (2004): 705–718. Nietzsche, Friedrich. Beyond Good and Evil, (original 1886) translated by by Helen Zimmern. Digireads.com, 2005. ISBN 1420922505. Peirce, C.S., Collected Papers of Charles Sanders Peirce, vols. 1–6, Charles Hartshorne and Paul Weiss, eds., vols. 7–8, Arthur W. Burks, ed., Cambridge, MA: Harvard University Press, 1931–1935, 1958. Cited as CP vol.para. __________. "The Fixation of Belief" in Popular Science Monthly 12 (1877): 1–15. Reprinted (CP 5.358–387), (CE 3, 242–257), (EP 1, 109–123). __________. "Truth and Falsity and Error" (in part), 718–720 in J.M. Baldwin, ed., Dictionary of Philosophy and Psychology, vol. 2. Reprinted, CP 5.565–573, 1901. Polanyi, Michael. The Tacit Dimension. Garden City, NY: Doubleday and Company, 1966. Quine, W. V., "Quantifiers and Propositional Attitudes," in Journal of Philosophy 53 (1956). Reprinted, in Quine, Ways of Paradox. (1976), 185–196. __________. The Ways of Paradox, and Other Essays. (1966) Revised and enlarged ed., Cambridge, MA: Harvard University Press, 1976. ISBN 0674948351. __________. From a Logical Point of View, Logico-Philosophical Essays, 2nd ed., Cambridge, MA: Harvard University Press, 1980. __________. "Reference and Modality," 139–159 in Quine, From a Logical Point of View. Cambridge, MA: Harvard University Press, 1961. Rajchman, John, and Cornel West. Post-Analytic Philosophy. New York, NY: Columbia University Press, 1985. ISBN 0231060661. Ramsey, F.P., "Facts and Propositions" 153–170. in Aristotelian Society Supplementary Volume 7, Reprinted, 34–51 in F.P. Ramsey, Philosophical Papers, David Hugh Mellor, ed., Cambridge, NY: Cambridge University Press, 1990. ISBN 0521374804. __________. Philosophical Papers, David Hugh Mellor, ed., Cambridge, NY: Cambridge University Press, 1990. ISBN 0521374804. Rawls, John. Lectures on the History of Moral Philosophy, Barbara Herman, ed., Cambridge, MA: Harvard University Press, 2000. ISBN 0674002962. Rescher, Nicholas. Pluralism: Against the Demand for Consensus. New York: Oxford University Press, 1995. ISBN 0198236018. Rorty, R., Philosophy and the Mirror of Nature. Princeton, NJ: Princeton University Press, 1979. ISBN 0691072361. Russell, Bertrand. The Problems of Philosophy. (1st published 1912). Reprinted, 1959. Reprinted, Buffalo, NY: Prometheus Books, 1988. __________. "The Philosophy of Logical Atomism" in The Monist, 1918. Reprinted, 177–281 in Logic and Knowledge: Essays 1901–1950, Robert Charles Marsh, ed., London, UK: Unwin Hyman, 1956. Reprinted, 35–155 in The Philosophy of Logical Atomism, David Pears, ed., La Salle, IL: Open Court, 1985. ISBN 0875484433. __________. Logic and Knowledge: Essays 1901–1950, Robert Charles Marsh, ed., New York, NY: Macmillan, 1956. ISBN 0041640012. __________. The Philosophy of Logical Atomism, David Pears, ed., La Salle, IL: Open Court, 1985. ISBN 0875484433. Smart, Ninian. The Religious Experience of Mankind. New York, NY: Charles Scribner's Sons, 1969. Tarski, A., Logic, Semantics, Metamathematics: Papers from 1923 to 1938, J.H. Woodger (trans. ), Oxford University Press: 1956. 2nd edition, John Corcoran, ed., Indianapolis, IN: Hackett Publishing, 1983. Wallace, Anthony F.C. Religion: An Anthropological View. New York, NY: Random House, 1966. Watts, Michael. Kierkegaard. Oxford, UK: Oneworld Publications, 2003. ISBN 1851683178. Yandell, Benjamin H. The Honors Class: Hilbert's Problems and Their Solvers. London: AK Peters, 2003. ISBN 1568812167. Audi, Robert. The Cambridge Dictionary of Philosophy. Cambridge University Press, 1995. 2nd ed., 1999. Cited as CDP. ISBN 0521402247. Blackburn, Simon. The Oxford Dictionary of Philosophy. Oxford University Press, 1994. Cited as ODP. ISBN 0192116940. Runes, Dagobert D., ed., Dictionary of Philosophy. New York: Philosophical Library, 1983. ISBN 0802223885. Webster's New International Dictionary of the English Language, Second Edition, Unabridged., W.A. Neilson, T.A. Knott, P.W. Carhart, eds., Springfield, MA: G. & C. Merriam Company, Cited as MWU, 1950. Webster's Ninth New Collegiate Dictionary, Frederick C. Mish, ed., Springfield, MA: Merriam–Webster Inc., 1983. Cited as MWC. ISBN 0877795088. All the Truths about TRUTH. An alphabetical summary (by author) of views about Truth in philosophy, history, science and religion. This page was last modified on 19 December 2015, at 18:08.